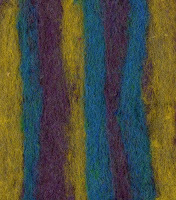 I created some funky striped felts a while back and recently decided to scan them in as images. I've been trying to figure out what to make with each of them, but am at a loss. I think that I'll put my little sewing machine to work this weekend and come up with something. I've also wondered about using the scanned images to make something with. Perhaps, they could become some postcards, buttons, or backgrounds to some other ingenious graphic design pieces. Hmmm . . . I really like the colors in each of the felted fabrics, but I just am not sure how to use them. If anyone has any great suggestions for my funky stripey felty fabrics, please don't be shy about it. Speak up! Spark my creativeness and help an artist out. I do think that I'll make some more striped felts eventually. I just love experimenting with color combinations. They don't always come out spectacularly, but nothing ever really does in art or life. Everything takes a little work and a little practice. Okay, sometimes it takes a lot of work and a lot of practice, but it seems to be always worth the effort.